Researchers from the University of Southampton have helped to develop pioneering 'tweezers' that use ultrasound beams to grip and manipulate tiny clusters of cells, which could lead to life-changing medical advances, such as better cartilage implants that reduce the need for knee replacement operations. Using ultrasonic sound fields, cartilage cells taken from a patient’s knee can be levitated for weeks in a nutrient-rich fluid. This means the nutrients can reach every part of the culture’s surface and, combined with the stimulation provided by the ultrasound, enables the cells to grow and to form better implant tissue than when grown on a glass petri dish. By holding the cells in the required position firmly but gently, the tweezers can also mould the growing tissue into exactly the right shape so that the implant is truly fit-for-purpose when inserted into the patient’s knee. Over 75,000 knee replacements are carried out each year in the UK; many could be avoided if cartilage implants could be improved. 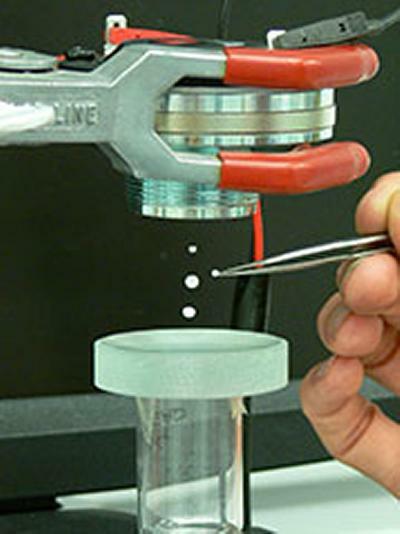 The ultrasonic tweezers were developed by researchers from the Universities of Southampton, Bristol, Dundee and Glasgow as well as a range of industrial partners. Professor Martyn Hill, Head of the Engineering Sciences Unit at the University of Southampton, led the cartilage tissue engineering work in collaboration with colleagues Dr Peter Glynne-Jones, New Frontiers Fellow in Engineering Sciences, Dr Rahul Tare, a Lecturer in Musculoskeletal Science and Bioengineering, and Professor Richard Oreffo, a Professor of Musculoskeletal Science.